Micalet: So this is eLearning? Sussex Learning Network's introduction to their eLearning Project, including a guided tour round Cetlment Island in Second Life. Later I went to the Open University's Moonlight Knights on Rockport Island, for a surreal tour round the facilities, including playing Beethoven's Moonlight Sonata (what else? ), disco dancing and barbershop singing. What next? 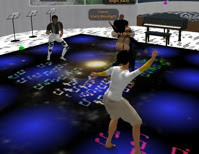 Labels: Dance, eLearning, Music, Second Life, So this is eLearning? Tesco Tesco, What's the time? 1-1 / To The Arsenal - yet again!